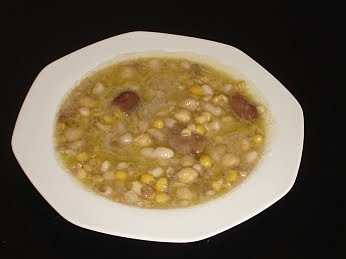 This ‘multi-grain’ or ‘multi-seed’ soup (sporos is the Greek word for seed) is really a kind of broth. It is traditionally made in villages on November 21st. The reasons for this are that it is the end of the planting season and so any grains / seeds that were left over would be cooked as a soup and this would also be ‘offered’ to the Virgin Mary (November 21st is one of her name days) in the hope that their crops would do well. It really is a delicious broth and very easy to prepare. Soak the broad beans in cold water from the morning of the previous day. Soak the chickpeas in tepid water with 1 level tablespoon of salt from the previous day. Next day, rinse the chickpeas thoroughly in plenty of water. Drain the broad beans and with the help of a sharp knife remove the upper black parts. Put all the ingredients in a heavy bottomed pan with enough water to more than cover them. Drain them and then put them back in the same pan and add boiling water – enough to cover them plus 4 cm. Beat the olive oil and lemon juice together well and pour on top of the soup.